You create a tuition schedule, specifying how to charge students within the schedule's brackets. You can also include a refund policy. You add the schedule to a student account, whether on an individual student's profile, or to a group of students using the Data Slicer. When the student enrolls in courses, a pending tuition charge is created. After reviewing the pending charges, you invoice them. Tuition schedules cover course enrollments, and so won't capture auditors. To set up an automatic charge for auditors, create an Auditor Fee. Go to Billing > Settings > Tuition Schedules. Type the name—e.g. "Undergraduate", "Doctoral 2014-2017", etc. Select what kind of units—credits or hours—this schedule will be based on. Now that you've created the tuition schedule, click its name to go to its page, where you set up the brackets and link the schedule to courses. Keep in mind that when you make changes to a tuition schedule, those changes will only affect students to whom you attach the tuition schedule from this point forward. For example, if you have a student who already has the "Undergraduate" tuition schedule, he will not be affected by any changes you make to it today. 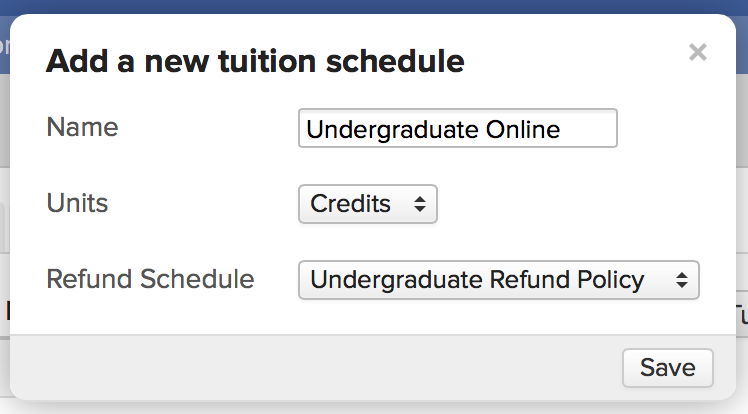 You can change any of the tuition schedule's basic details by clicking edit next to Info. Change the name just by typing. Change the units by selecting a different one from the drop-down. Provided you've set up refund policies, you can add or change the schedule's policy by selecting it from the drop-down. Retire a tuition schedule if you've ever invoiced charges generated by that schedule but no longer want students to have it. Retiring prevents you from adding it to any more students. You can Delete a tuition schedule if it is not listed as the default tuition schedule for any student. Remember, only delete mistakes! Click edit next to Tuition Brackets to add or edit brackets. Select an income account from your Chart of Accounts. Enter the maximum number of credits/hours for the bracket (the minimum credits for the next bracket will auto-fill). Let's say you charge one way for 0-12 credits, and then another way for 12-18 credits. For the 0-12 bracket, enter 11.99 in Max Credits; this lets the next bracket pick up at 12. Enter a Flat Amount, or leave it as "0". This will charge a student the same amount if they enroll within the bracket. Enter a Per-Credit Amount, or leave it as "0". This will charge the student this amount for each whole credit, or pro-rate the amount for each fractional credit, within the bracket. Click to remove a bracket. If you do this, the credit range of the other brackets will adjust accordingly, so double-check your work before committing such changes. Click add a bracket to create new brackets. Enter the maximum credits for the bracket just as you would for a regular bracket. Enter a Flat Amount and a Per-Credit Amount, and then enter a value in For Credits Above. This will charge the student the Flat Rate if she enrolls within the bracket's minimum credits and For Credits Above value. It will charge the student an additional Per-Credit Amount if she enrolls within the bracket's For Credits Above and maximum credits value. Tuition schedules are attached to individual courses. When a student with a given schedule enrolls in a course with that same schedule, he will be charged for that enrollment. Use the filter to view particular courses connected to this schedule. You can filter by course abbreviation, department, or academic program. Click edit to make changes to the course list. You'll have the same filter to sort through your course catalog. Check the courses to which you wish to attach the schedule; un-check courses to disassociate them from the schedule. When you're done, click Finished Editing Courses. Is there a way to "retire" tuition schedules like there is for room and meal plans? Looks like the article was a bit vague. I've updated it... basically, just go to the tuition schedule's page and edit its Status and set it to Retired.